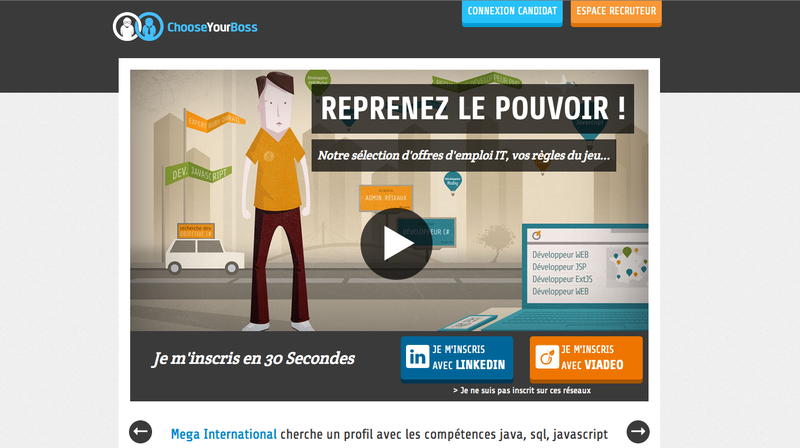 Choose Your Boss is a new generation recruitement website, specialized in IT profiles. Our customer asked us to help him find a solution to his own customers : how to recruit IT profiles? How to find great teams for developers? I interviewed, several dozens of potential job candidates, and a couple dozen of IT recruiters. And we finally came with this recruitement website, where the power is inversed between recruiters and high qualified profiles. I was involved in both customer and product development, as an intrapreneur. Problem Inteviews with several dozens of candidates and recruiters : do we really have a problem? Solution Interviews with candidates and recruiters : does our solution can solve the problem? Development of first MVPs in Ruby on Rails 3, CoffeeScript and HTML5. Closely working with sales team while my co founder closely works with marketing team. Creation of the sales offer, sales material, elaboration of the sales argumentation, and customer meetings. Working on partnerships and pitching to everyone who wants to listen, and more!